Now that Nintendo Switch has arrived, we've all had a chance to get to know the BigN's latest console and boy is it one impressive little package. From brilliant open-worlds running on tiny, sour-tasting cartridges to HD rumbles and overtly-suggestive motion control games, Switch is everything we'd hoped for and more. It does have its limitations, but that doesn't mean you can't apply a few clever tricks to supercharge your handheld/tabletop box of tricks into the best console it can be right now. You'll find ten of our favourites below, so give them a try and see how you can power up your very own Nintendo Switch. Unlike all the Nintendo consoles that came before it, the plucky lil' Switch comes completely region free. Not only does this mean you can buy compatible cartridges from anywhere in the world, you can also access any region's eShop. To do this, you'll need to create a new account on the Nintendo Accounts site and select a specific region (for instance, Japan usually has more titles and demos on offer). You'll then be sent an activation code via email (make sure this is an additional email account you have access to) then you'll be free to log in and start buying games from said nation. While you'll need to set an account up for each different region you wish to access, it's still a relatively painless way to widen your choices. While Switch won't close your game if you return to the main menu, it's still a bit of a rigmarole if you're only looking to tweak a few settings. Much like Xbox One, Switch has a special (and pretty discreet) in-game menu that pops up instantaneously. All you need to do is hold down the Home button for a second and it'll slid out of the right of the screen. From here you can enter Sleep mode, adjust brightness and activate Flight mode. Just keep in mind that the menu is completely independent of you game, so it won't automatically pause it. If you're currently in the thick of the action, we suggest pausing or bringing up a menu before holding down Home. You know how easy it is to share screenshots on PS4? Pfft! Switch's own version is even simpler. On the left-hand Joy-Con at the bottom you'll see a square button, this is your screenshot button - simply give it a press and your capture is store in the Album folder. Want to share them on social media? Head to the Album folder (the blue icon beneath your game tiles on the main menu), press A to select it and A again for 'Editing and Posting'. You can now edit the image and add text. You can currently post screens to Twitter or Facebook. To get your friends suitably jealous of Breath of the Wild and the like, simply link your account and it'll be posted for all to see. 10 reasons you need to be excited for Nintendo Switch! While cartridges don't have the biggest of memories, Nintendo has shipped Switch with one very handy feature - MicroSD support. If you're into downloading a lot of digital titles from the eShop (or you really want to export your screens to your laptop, Mac or PC), this feature is for you. For a start, the MicroSD slot is located underneath the kickstand, so give it a quick pull to reveal it. As standard, all screenshots are saved to the Switch itself, so you'll need to copy them all to your newly inserted memory card. Once the Switch restarts (it'll do this as soon as the MicroSD is slotted in), the memory card will now become your default save location for screens. However, MicroSDs are tied to a single Switch so you won't be able to export them between consoles. Ever wondered why you can't currently buy a new Switch Dock from Nintendo? Turns out said tabletop charging stand can sometimes scratch the bottom left of your screen when removing it/slotting it in. If you're careful enough you could avoid this issue, but considering how expensive your gaming-focused tablet/console hybrid is a good screen protector is a must-have investment. The official Nintendo screen protector (made by Japanese fightstick specialist Hori) will set you back around £8, but most third-party alternatives should also do the trick. Just make sure it comes with a decent shammy so you can clean your screen first. Switch being the versatile handheld/tabletop darling that is, there's a good chance we all deplete the charge in our Joy-Cons in a variety of different ways. With a CPU and GPU intensive game such as Breath of the Wild, chances are your dual controller setup will be drained dead in three or more hours. However, there are ways to maximise your battery while at home. The Joy-Con pad that came with your console doesn't charge, but you can buy one one that does fill your Joy-Cons with juice while you're playing. The official Nintendo Switch Joy-Con Charging Grip will currently set you back £42 (which is a lot cheaper than the £60+ Pro Controller), but it's a great way to keep those Joy-Cons charged while your're playing in tabletop mode. Nintendo has always been a family-focused company, so we'll go out on a limb and say there's a chance the smaller people in your life might want to give your Switch a go. Of course, not every game coming to Switch is age appropriate so you can set Parental Controls to keep the sprogs from beheading people in Skyrim. You can do this via the System Settings on the Switch itself, or you can make said tweaks via the very handy Nintendo Switch Parental Controls app. Available on the App Store and Google Play, the app doesn't just enable you to lock off certain games, it even gives you the power to set game timers and bedtime reminders. Since you're more likely to have your phone on you than your Switch most of the time, you can simply log in and check all is well. 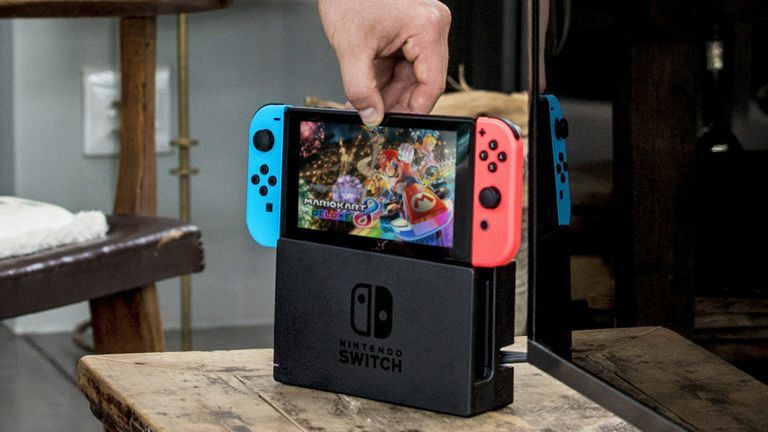 One of Switch's key selling points is the oh-so-brilliant ability to shift from handheld mode to TV-based gaming mere moments after sliding your Switch into the Dock. However, since all of our TVs have myriad picture settings, the image you first see isn't always the best one. On your Switch, go to System Settings and scroll down to the TV Output section. From here, change TV Resolution to Automatic and update RGB Range to Full range - this is the best output setup from Switch's end. So now you just need to head on over to your TV of choice, dock the Switch and tweak your settings so the colours don't seem so washed out. While there are ways to reduce the toll of your gaming habits on Switch's battery (such as reducing the brightness of the display and turning the entire console off at night if you're not able to dock it), if you're taking it on a big commute it'll run the risk of dying en route. The best way to keep gaming for longer on the move is an external battery, which connects to your Switch via the USB-C port at the bottom (the one the Dock uses to connect to your Switch). These can retail anywhere between £18 and £50, and the performance of each will depend on the make and the demands of the game you're playing at the time. Be sure to shop around first before putting down some cash. That aforementioned USB-C slot isn't just there for charging your Switch while docked or connecting it to a power bank - in fact, we're probably just seeing the tip of the iceberg when it comes to future features. One utility that's supported right now, however, is the USB keyboard. Right now, these accessories only really help you with anything text-based - so that's basically just searching in the eShop and typing messages to go with your screenshots - but considering the support is even there suggests Nintendo could eventually patch in a bespoke browser and social media apps. Interestingly, you can actually access Twitter and Facebook direct via your Switch (there are links to access them at the bottom of the screen when you link your accounts to the console), but it's very patchy.